I thought it was dead. A goner. When I left home this morning it was fully charged and when I took it out of my laptop bag on the bus to check the time, it was off. I pressed the power button obsessively. Nothing. Held the home button. Nada. Held both together. The screen remained black. Crap! How would I scan the QR code to know when my transfer bus was coming? Crap! I guess I would just keep turning around to check for the bus as I walked along 86th Street. As I walked, no bus approached. So I started walking through the park. Now that I was making my way through the beautiful park, how would I capture all the beauty I was seeing? Well… I just looked at it with my eyes, instead of through a phone. Did I really need to capture every flower or tree bud on my phone and post to my Instagram? Of course not. As much as I love sharing photos, it was lovely to enjoy the experience alone. As I exited the park, I knew I was nearing the school location but couldn’t remember the address. How was I going to confirm the location? Shoot! I crossed Central Park West and walked down 87th Street, where I thought the school was located… but I didn’t see it. Damn! Now what? How did we survive without Google maps? Thankfully there a dude walking toward me with his phone in his hand… so I asked him if he knew where the Dwight School was. He didn’t… Damn. So I asked if he minded checking the address for me… No problem! Turns out I was two blocks away, no big. I thanked him and was on my way. As I arrived at the school I wondered: how would I tweet photos for EdCamp? Ok now this was getting to me… Once I signed in and found a place to sit in the common area, I plugged my phone into my computer, sure that it would vibrate as soon as I plugged it in. Nope. What the? So again I obsessively pressed and held the power button. Nothing. I decided to try a wall plug. Nothing. And then another, nothing still. 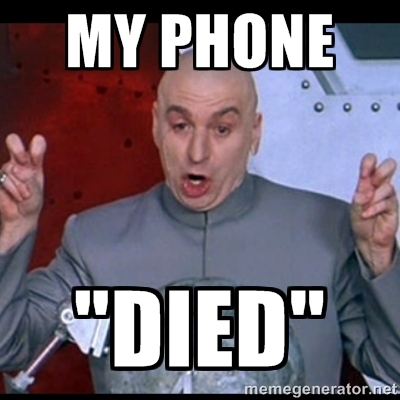 I was convinced my phone was, in fact, dead. So as I sat back at the table, I plugged my phone into my computer one last time, wondering why I’d even bother, but then… it buzzed. It was alive! And 94% charged. Yep we made it forever with no phones.. But I did have to rely on someone with a phone lol!